jimthompson.org » Blog Archive » Hello Jakarta, Indonesia! I’ve been waiting to receive an invitation to join Measure Map, ever since I heard about the service through Matt Mullenweg’s weblog, and read more about it on Jeffrey Veen’s weblog. It’s an intriguing service and I wanted to try it out, so I gave them my email address and waited. And waited. And waited. It’s been about six weeks so far. I received an email a couple of weeks ago that said, essentially, “Don’t forget about us, we’re going live real soon now.” They say they’re sending out invitations, but I guess I’m not at the top of their list. Thanks a million, guys. While I was waiting, though, a funny thing happened: Google announced its new service called Google Analytics. Measure Map and Google Analytics are both services designed to let you track who visits your web site, how long they stay on your web site, how often they come back, and that kind of thing. Google Analytics is designed with web-based businesses in mind, and has tools like Goals to help businesses measure how many people go to their “Checkout” page, for example. I can’t say how Measure Map is oriented, because all I’ve seen of their site is a few pretty pictures. Of course, those statistics cover only two days of data. Hopefully, as the weeks an months draw out, someone in Sydney or Cairo will pay me a visit and I can claim six of the seven continents. For example Google Analytics can report whether you have the Flash plugin installed and what version of Flash you’re using. It can report whether you have a Java enabled. It can report the size of your screen, and whether you have 8-bit, 16-bit, or 24-bit color. It can report whether you’re visiting over a dialup connection, a broadband connection, or a corporate connection – which would presumably include T1, T3, and the like. These kinds of data just aren’t known to the web server, and so Google Analytics is able to show data that you just can’t discover by analyzing your server’s log. I’ve just scratched the surface of what you can learn, and the kinds of things you can do with Google Analytics. This is powerful analysis, and the best part is that for most of us, it’s free. Once again, Google is disrupting the status quo. I bet those guys at Measure Maps are kicking themselves for not getting their service released sooner. By the time they get around to sending me an invitation, if they ever do, I may not even care. This entry was posted on Wednesday, November 16th, 2005 at 6:48 pm	and is filed under Site. You can follow any responses to this entry through the RSS 2.0 feed. Both comments and pings are currently closed. The fact that 91.75% of the visitors to your site are first-time visitors, is because your counter is new and does not yet have historical data of your visitors (cookies?). You will see that after a week or so, this number will go down drastically. By the way, I am a bit disappointed by the slowness of the updates. Google states on their website that normally the new data should be displayed in about 6 hours which I think is a bit disappointing as I am used to having access to ‘live’ stats data. 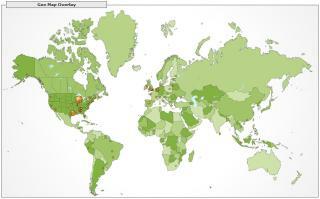 As I use Google Analytics mainly for tracking my weblogs I am still anxiously awaiting an invitation for Measure Map which I think is more suitable for my needs. I expect the updates to become more timely as the initial crush subsides in the first few weeks. That will also give Google more time to load-balance their system, which they’re very good at. Yeah, I’ll probably take a look at Measure Map if I ever get invited. Who knows – maybe it will turn out to be better for my needs. But the longer they wait to invite people like me, the more ingrained to Analytics we will become, and the less likely to switch. The Measure Map people need to hurry or Google will bury them. jimthompson.org is powered by WordPress | 15 queries. 0.102 seconds.